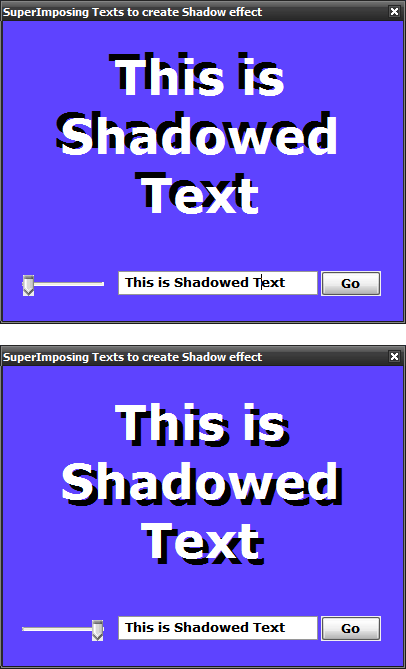 How to Display Shadowed Text in a GUI ? one over the another (with a slight offset) to create an effect of shadowed text. These texts have to be colored in contrast with each other. horizontally offset from the Black colored text by 4 pixels. This might be a good technique for large sized texts only. I use this technique when scripting an Installer with AHK. Compare these 2 snapshots taken from a working demo. I had sent you a PM (just a thank note! ), but I see you have not read it. "Keep 'em coming": excellent work !